Happy Valentine’s Day! I brought you some breakfast in bed. Bright, sunshiny Meyer Lemon Buttermilk Waffles dusted with powdered sugar and finished with a squeeze of fresh Meyer lemon juice on top. In a mixing bowl, combine the flour, baking soda, and salt. In another bowl, whisk together the buttermilk, milk, melted butter, eggs, sugar, and lemon juice and zest. Pour mixture over the dry ingredients and whisk together until smooth. Spoon batter into your waffle iron as directed by manufacturers instructions. Cook until golden brown, crisp, and cooked through (in my waffle iron, that's about 4 minutes). 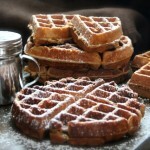 Serve waffles immediately with powdered sugar and lemon wedges, with butter and syrup on the side.